For once, I’d like to make a holiday post that actually gets published before the holiday! It seems the best I can hope for is to record with my camera and update later. 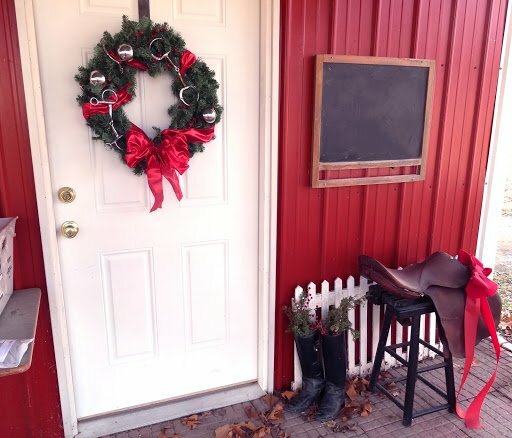 Our tack store is set in a newer building at the back of our property near the 80 year old stable and chicken coop. 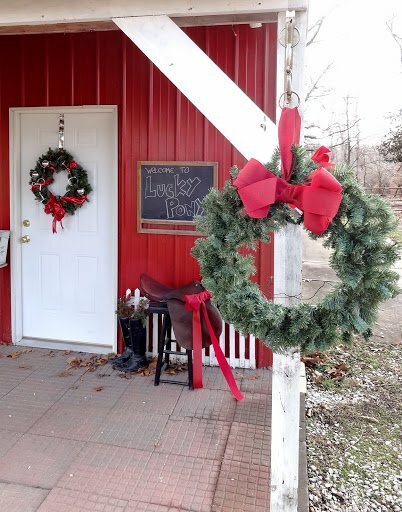 Every year I try to decorate just a little more of the property for Christmas- this year the store’s exterior made the to-do list! Perhaps my favorite element, I loved arranging this equestrian themed wreath with a plain wreath, ribbon, berries, silver ornaments- and horse bits and spurs! Nothing says Christmas to an equestrian like new tack! While we wouldn’t use any nice items for our outdoor display, this poor old Crosby saddle with a broken tree has been an outdoor decoration for a few years now- and more or less thrives as long as I scrub her off, let dry, and oil her deeply once a year. Old tall boots are held upright with rocks in the foot and a small board secured with a screw through the sole. Sprigs of evergreen and Winter Berry make them festive.